Over the weekend I was up in Unity, Maine for the Common Ground Fair. 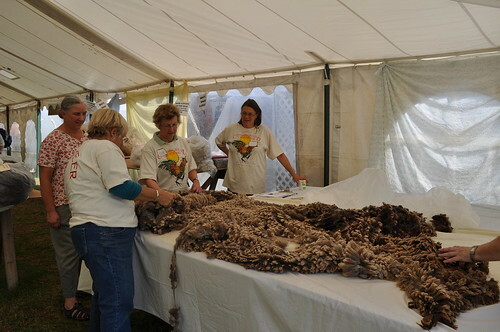 Held every year at the end of September the country fair celebrates rural and agricultural traditions of Maine. My favorite part was the fleece sale. 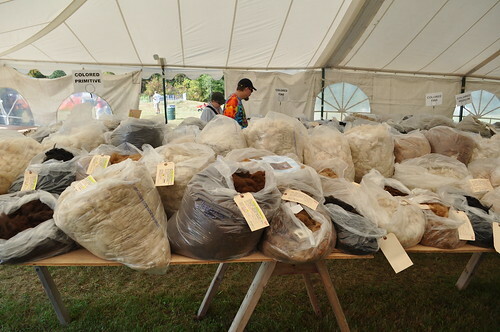 Hundred of bags packed to the brim with raw wool line long tables. 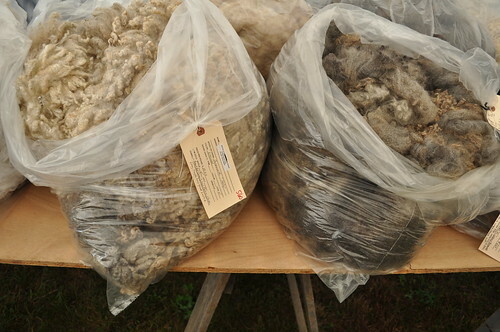 The fleeces are “organized initially by color and then grade, with each grower’s fleeces grouped together within the respective category”. I saw a number of spinners carefully inspecting each of the bags. You could tell by the look on their faces this was their version of Disney World. A large piece of fleece below being inspected by judges and a farmer showing me how to properly look at the fleece on a sheep—you never want to poke it because the fibers will get matted and tangled. 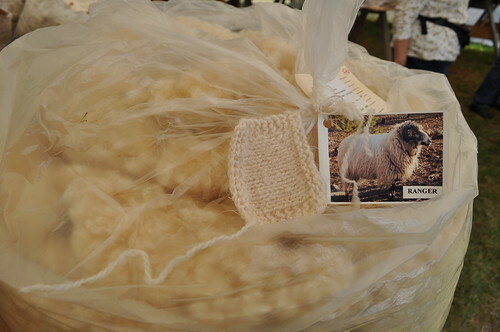 The area shown is the highest quality merino wool. Gorgeous, right? Whoa! That is so nifty! I just want to dig my hands into all of it! This looks like such a great fair! I would’ve loved to be there. I love the smell of barns, which I realize is kind of weird. 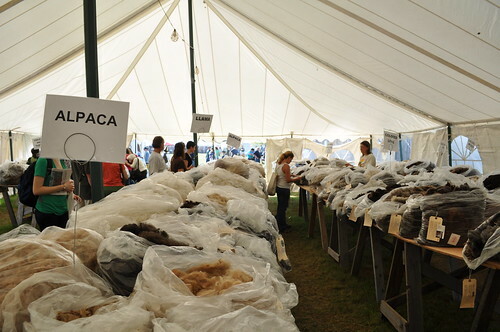 But all of that fleece! Oh my goodness. I grew up in Maine and remember going to this fair as a child and being disappointed when there were no rides. I was in the 4-H sheep club so I showed sheep there. your are so lucky!! i LOVE LOVE the common ground fair. Thanks Katy – I have always wanted to go to this fair but usually go to Maine in August and don’t make the long drive back in September so your pics are especially appreciated! I don’t spin anymore but those Merino are so tempting – too long of a process for me though (I have to keep that in mind). Hope you have more pics to share! I really envy you!!!! what a lovely, lovely, lovely exhibition!!! !